Scanning electron microscopy images confirm the deposition of an extracellular matrix which embeds cells, presumably of both stromal and blood origins. 06-Jun-2018: Every day in the bone marrow several billion blood cells are formed. This constant supply is ensured by blood stem cells located in special niches within the marrow. These stem cells can multiply and mature into red and white blood cells, which then leave the bone marrow and enter the bloodstream. For several years, researchers have been trying to reproduce natural bone marrow in the laboratory in order to better understand the mechanisms of blood formation and to develop new therapies – such as for the treatment of leukemia. However, this has proven to be extremely difficult because – in conventional in vitro models – the blood stem cells lose their ability to multiply and to differentiate into different types of blood cells. Now, researchers have engineered an artificial bone marrow niche, in which the stem and progenitor cells are able to multiply for a period of several days. These findings were reported by researchers working under Professor Ivan Martin from the Department of Biomedicine at the University of Basel and University Hospital Basel and Professor Timm Schroeder from ETH Zurich’s Department of Biosystems Science and Engineering. 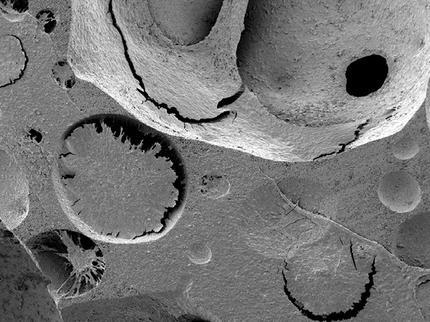 The researchers have developed an artificial tissue that mimics some of the complex biological properties of natural bone marrow niches. To do this, they combined human mesenchymal stromal cells with a porous, bone-like 3D scaffold made of a ceramic material in what is known as a perfusion bioreactor, which was used to combine biological and synthetic materials. This gave rise to a structure covered with a stromal extracellular matrix embedding blood cells. In this respect, the artificial tissue had a very similar molecular structure to natural bone marrow niches, creating an environment in which the functionality of hematopoietic stem and progenitor cells could largely be maintained. The new technique could also be used to produce tailor-made bone marrow niches that have specific molecular properties and that allow the selective incorporation or removal of individual proteins. This opens up a whole host of possibilities, from researching factors that influence blood formation in humans, to drug screening with a view to predicting how individual patients will respond to a certain treatment. “We could use bone and bone marrow cells from patients to create an in vitro model of blood diseases such as leukemia, for example. Importantly, we could do this in an environment that consists exclusively of human cells and which incorporates conditions tailored to the specific individual,” explain Ivan Martin and Timm Schroeder.